Several of the students receiving awards (from left): James Bates, Estefannie Gutierrez de la Garza, Chrysanthi Chaleva-Ntina, Binh Le and Xifeng Gao.On April 23, the Department of Computer Science celebrated graduating computer science students at the Spring 2013 Graduation Luncheon in the Elizabeth D. Rockwell Pavilion at the University of Houston’s M.D. Anderson Library. The luncheon honored all graduating students from the current academic year and graduates from the Summer 2012 semester. There were more than 100 graduates from the undergraduate and graduate programs this year. The department also recognized several students for their outstanding academic achievements. 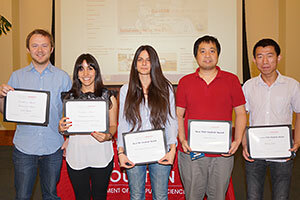 Four undergraduate students received the Undergraduate Excellence Award. The award has two categories. Category I goes to majors who complete between five and 10 computer science courses while maintaining university and computer science GPAs of 3.25 and better. Category II recognizes majors who complete 10 or more courses with a GPA of 3.25 and better. Five graduate students in our doctoral and master’s degree programs were recognized for their accomplishments in academics and research.